This is a controversial topic. Whether you can share the best way to eat healthy on a budget or why you think this is a copout, please let us know! I also think it is disturbing. It is disturbing that we have a sociopolitical system that prioritizes new tanks and fighter planes, and subsidies for companies that produce products that kill us; over education and subsidies for the development and distribution of products that will enhance the quality of life for people. That is capitalism run amok and cruising rudderless through a wasteland devoid of morals and ehtics. 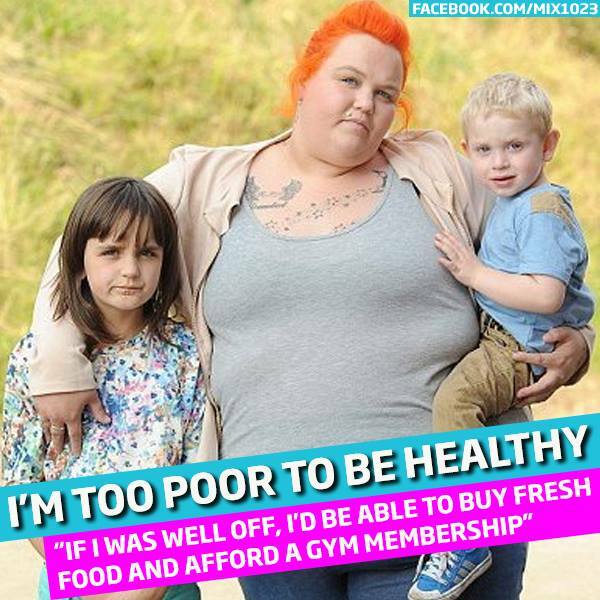 but she can afford tattoos and a dye job for herself… curious. There is so much that goes into creating how we live our lives. The rule of thumb I use for myself and with my clients is to move in the direction of adding as many fresh vegetables as you can and to move more. There are health issues that can make it difficult to lose weight, but increasing healthier foods is always a good start.